About this time last year, at E3, I was chewing the fat with a 2K Sports representative about NBA 2K11 which already looked to be the monster it would become. Long dominant in the pro basketball genre, the game with Michael Jordan on its cover was going to be 2K's Sunday punch to EA Sports. "That's the idea," the guy told me. "Get an exclusive deal without paying for it." It's not braggodocio and it's not an unreasonable expectation to beat the other publisher into giving up, as recent events have shown. For as NBA 2K11's roundhouse assuredly influenced EA's decision to scrap the troubled NBA Elite series-both last year and this year-2K's struggles against EA's similarly dominant NHL franchise led to it walking away from ice hockey, perhaps for good. 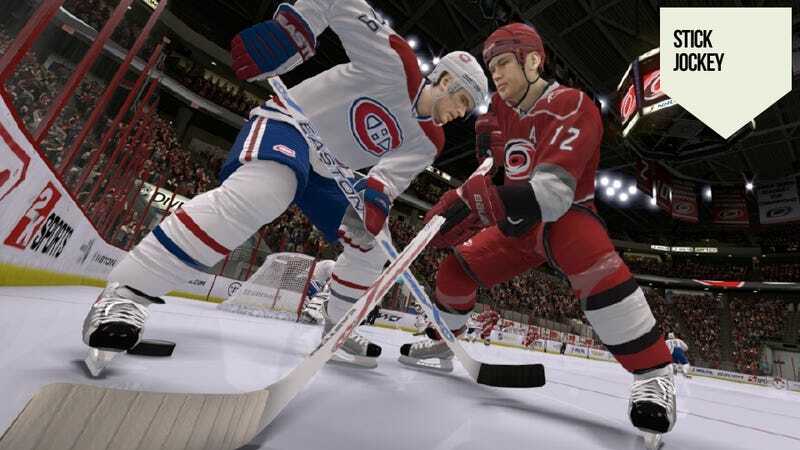 This week, 2K Sports confirmed it will not publish NHL 2K12. The publisher put the series on hiatus last year, except for its Wii version, telling the public it would use an extra year of development time to come back with a better title. Instead, it's not going to publish any game on any console. Today, in video gaming, there is only one fully licensed simulation available for all consoles in each team sport. Madden's notorious exclusive license with the NFL gets the most attention, but FIFA's deal with its titular authority, and exclusive pacts with other international football leagues, have also helped to relegate Pro Evolution Soccer to its also-ran status. 2K Sports may cling to an exclusive license making MLB 2K the only baseball simulation on the Xbox 360; the series' poor quality means that on the PS3, MLB The Show is the only real option. But in other areas, the free market has swung the axe on its own. Going two years without a title, it's fair to doubt that NHL 2K and NBA Elite will ever publish again. I'd give the latter more of a shot as it's a more valuable license than hockey and EA Sports has money to match its pride. 2K Sports recently announced an extension of its deal with the NBA but, notably, it was not an exclusive agreement. Then again, why should it be? There won't be a competing product for at least another 18 months, if ever. Still, there is only one college football game. There's only one NASCAR game. There's only one golf simulation, only one boxing simulation, only one pro wrestling "simulation," and when 2012 rolls around, we'll probably have just one mixed martial arts sim. The UFC just bought Strikeforce, the major licensee of last year's EA Sports MMA. The UFC has an exclusive deal with THQ; it's also run by Dana White. Dana White also hates EA Sports, or at least says so in public. Development costs have plenty to do with it, especially in a poorer economy. I'd argue, however, that after a decade of refining the games, with visual capabilities ever approaching photorealism, the creative difficulty of differentiating these titles is an especially big reason, too. These are games based on sports with rule sets that are, in many cases, more than 100 years old. The guts of how the game is played isn't changing much at all. Established annual sports titles struggle every year against the perception it's the same as the previous edition. If a game like Madden has a problem distinguishing itself against no competition, how is it any easier for a contender sports product to break out? NHL 2K, criticized as too arcadelike in gameplay, went back to the bench because EA Sports' NHL has just about every angle of the sport covered. They added in junior hockey last year to the career mode, for God's sake, and will finally bring The Winter Classic to the next edition. When NHL 2K last went head-to-head with it, we were talking about things like stick lifts and stumble shots, which are fine details, but not true selling points. NBA Elite attempted to do what NHL 2K could not, and thoroughly revolutionize the game's control set. The rest of the project looked terrible, however, with bland player animations and embarrassing visual glitches. Backbreaker is the last ground-up team sports simulation of any note. The unlicensed American football title spent three years in development, staggered out of the gate, and its studio is now making iPhone games. The Backbreaker sequel that's planned is an improvement of the "Tackle Alley" minigame and will be sold by digital download only. Some point to the expiration of 2K's deal with MLB as the chance for MVP Baseball to rejoin the picture and create some competition. I do think Major League Baseball is delusional if it thinks it can command another third-party exclusive license. I absolutely think MVP will return. EA Sports just built a Facebook game with an MLB license. And baseball plus EA Sports' Ultimate Team - a huge success in FIFA, NHL and Madden - is a money printing press. But, deep down, in the parts of my mind where I think NHL 2K, NBA Elite and EA Sports MMA are as good as gone forever, I also think 2K will walk from a series that it hasn't gotten right on the current console generation, leaving baseball video gamers with, again, another exclusive deal by default. We had better get used to them.